Olympic curling gold medallist Rhona Howie is to lead Bowls Scotland's high-performance programme along with former world champion John Price. Howie (formerly Martin), who was Team GB curling coach, has been appointed its first-ever high performance manager for the outdoor game. Welshman Price is its first high-performance coach. Previous head coach David Gourlay led his squad to three gold medals and a silver at the Commonwealth Games. 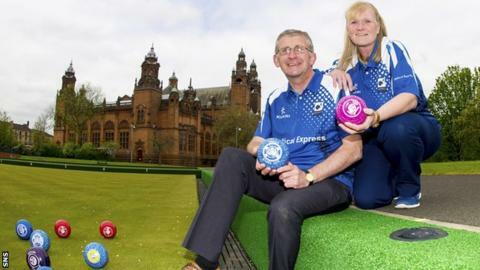 They also won six medals, including three golds, at the 2012 world championships in Adelaide and Bowls Scotland hopes to build on that success. It says Howie, who won Olympic gold in Salt Lake City in 2002, "will support and monitor the planning of all its programmes and develop new concepts that will ensure Scotland leads the world in the delivery of high-performance bowls". Admitting that bowls and curling were completely different disciplines, Howie told BBC Scotland: "There are some similarities, but it is more the high-performance side of sport that I'm going to be looking at. "Curling was probably at this stage over a decade ago, so how can we bring high-performance sport in? "David Gourlay has started to implement the high-performance side to the sport and I look forward to continuing this process. "They are winning a lot of medals now at bowling, so we need to keep that going. "It is a completely new challenge, but there are a lot of areas I've been involved in over the last decade, so I'm looking forward to it." Curling champions Eve Muirhead and David Murdoch took to the gym as part of Howie's high-performance programme, but Martin could not say what she would recommend for the bowlers at this stage. "Every sport's different and every athlete's different," she said. "I don't think I can compare what I'm going to do in bowls to what the curlers do. "But what I want to do is make sure these athletes are prepared to perform. "Whether its fitness or psychology, we need to develop the athletes personally to deliver." Price, who was previously national development officer with the Welsh Bowls Federation, will oversee the coaching and selection of the male and female teams - and coaches. He said: "In football terms, this is like getting the Real Madrid or Barcelona job. "It's the biggest thing you can get in bowls; it's a big responsibility and I'm really looking forward to the challenge. "There has always been a good depth of talent in Scotland in both men's and ladies' bowls and, in recent years, the team have been successful at the world championships and Commonwealth Games. "It will be very important to keep that momentum going."